apessnerd – Page 2 – WHAT WOULD WILLIAM APESS DO? I hope everyone is enjoying the season of renewal and regeneration, whether as part of the Christian cycle of death and rebirth or in spiritual sympathy with the natural rhythms of the earth’s springing. If you are anything like me (and let’s face it, you’re not), rather than hunting for Easter eggs or devouring chocolate bunnies on this morning, you will be asking yourselves the existential question, what would Apess do? That William Apess identified with the Christ story in profound and personal ways is made evident in his writings and certainly pertains to his thinking. Perhaps this should not be surprising, given his status as an ordained Methodist minister, but he was also a Pequot Indian and the associations with Christ he most often drew upon in his writings focus on how we treat one another as fellow human travellers on this earth rather than the mystery of Christ’s rising from the tomb. These associations were directly related to the tensions he often experienced as an Indian promoting the gospel of the white man–and never more so than as he began to set his mind to confronting the long history of abuses taking place on the Mashpee Wampanoag reservation in Cape Cod in 1833. One of the first things Apess did when he decided to make the Mashpee cause his own, was to retrieve his family, living in Essex, MA at the time, and bring them by boat to Cape Cod. On June 18th the boat debarked in Barnstable, the local hub and a town largely hostile to the cause of the Natives at Mashpee. Here Apess’s family was refused lodging at every inn, despite one of his children being ill. Finally, with nowhere else to turn, he was able to secure shelter in a local stable, charged two dollars for the privilege. The anecdote, which he relates in his 1835 book, Indian Nullification, is clearly analogous to the New Testament story of Mary and Joseph seeking lodging in Bethlehem. But Apess’ story is designed to demonstrate how Natives were essentially better practitioners of Christian values than the white populace of Barnstable. Apess cannot but compare his usage here with how strangers were treated in Mashpee, where, as he observes, due to longstanding traditions of hospitality, “I do not believe that one of the whole tribe would turn [a stranger] from his door, savages though they be.” He concludes the passage by observing “we regarded ourselves, in some sort, as a tribe of Israelites suffering under the rod of despotic pharaohs; for thus far our cries and remonstrances had been of no avail. We were compelled to make our bricks with straw.” Despite dealing with both systemic and day to day prejudice, however, Apess consistently promoted a doctrine of peace, understanding that resistance through peaceful measures was the most effective course Native people of New England could chart for themselves to achieve societal reform. Worcester made perfectly clear that he was willing to be a prisoner of conscience, but it is uncertain what specific political outcome he sought as a result of his actions beyond challenging the justness of the law itself. Worcester was a committed advocate to the Cherokee people leading up to the removal and his case would travel all the way to the Supreme Court in 1832 leading to legislation that continues to this day to define the status of Native Americans in relation to the U.S. government. But Worcester’s primary goal was not to orchestrate a movement of civil resistance or prevent the removal of the Cherokee to territories west of the Mississippi, so much as it was to continue his missionary efforts without interference. Worcester, in fact, would remove his own mission west even prior to the signing of the 1835 Treaty of New Echota which split the Cherokee Nation and paved the way for forced removal. The movement at Mashpee was, in most ways, designed to mimic non-violent strategies the Cherokee people had put in motion, by forging a constitution and passing resolutions asserting sovereign control over Mashpee homelands. Apess, who seems to have anticipated a prison sentence as a result of his actions at Mashpee, surely knew of Worcester’s stance and its successful outcome in the 1832 Worcester vs. the State of Georgia decision. But he seems to have come to Mashpee with a more coherent strategy, taking direct non-violent action and hoping to use his subsequent jail sentence as a means of bringing moral clarity and transparency to the abuses taking place on New England Indian reservations. For the most part, this is not a question with which white America has been eager to engage, knowing that the answer might very well provoke a tectonic shift in the cognitive terrain upon which we build our fortresses of certainty, our shining cities upon a hill. But I float it out there this morning, in this season of renewal, in hopes that we are fast approaching a day when such considerations might not set the world on edge. Because, I think that’s what Apess would do. Author apessnerdPosted on April 1, 2018 September 28, 2018 Leave a comment on HAPPY EASTER? I’d like to encourage people to wear their What Would Apess Do? t-shirts to the March For Our Lives gatherings in your communities on Saturday March 24. Send me a photo of you wearing your t-shirt via FB and we will add it to the Image Gallery here. Spark a conversation and let people know that Native Lives Matter. No doubt guns were a part of life for Native communities in Apess’s time, but given his commitments to peaceful resistance, Apess surely would have understood how the presence of weapons of war in our communities only escalate opportunities for violence and oppression. I dare say Apess would have supported the children of Marjory Stoneman Douglass who are, like the Son of the Forest, serving as grass roots community activists taking on giant forces in the name of peace. Engraving made from 1830 John Paradise portrait of William Apess, which appears in the 1831 edition of Apess’s A Son of the Forest. I want to thank those of you who have donated to the Historical Marker commemorating William Apess’ 1798 birth in the town of Colrain, Massachusetts. I want to briefly explain how I first came upon the idea for this marker and why I think it is so important. I first came to Colrain in the summer of 2013 to begin research on a biography of Apess I was planning to write. The project was still somewhat shapeless and wide open before me, but I thought any effort to understand his life might begin by going to the place where, according to his own memoir (the 1829 A Son of the Forest), he was born. I make this qualification, “according to his memoir,” because, at least as far as I can find in the extensive archival research I have conducted since, there is no other record of William Apess’ birth. Anishinaabe historian Jean O’Brien points out that, by the close of the eighteenth century, neither minister nor town clerk “took care to record the beginnings and ends of Indian lives.” This negligence contributed to the overall sense that Native people were somehow vanishing, fading from the landscape “like snow in springtime” as many historians of the era liked to say. Still, I thought that in the place of Apess’ birth I might find some trace of his existence. So began a diligent search, scanning the names on cracked and moss covered tombstones, checking old property maps and deeds, combing through every book and document in the town library. I was surprised at the energy and enthusiasm with which this tiny little town of about 2,000 souls had curated its own history. There are two long shelves in the library devoted to both published and unpublished works recalling in florid prose Colrain’s progress from a backwoods settlement on the frontier of colonial expansion to the rustic, small scale, agricultural/mill hamlet it remains today. These histories, in the timbre of the times, glorified the spirit of the hearty settler while painting indigenous identity as an ever-present “savage” threat, skulking about the shadows of Colrain’s cleared perimeter. Such representations pretty much foreclosed on the possibility of Native people living within the town itself as participating members of the community. And yet this was clearly the case. The Apess’ were neither invaders nor intruders. Like many Native families of the time, they were simply a young couple in 1798 looking for a way to eke out a living in an economic and cultural environment that did not much welcome their presence. When I finally did come across a reference to the Apes name (as it was spelled then), it was not in any of the town histories or promotional materials. Among the final entries of a frayed old record book in the Town Clerk’s office, labeled Buckland, Colrain, Montague Vital Records, is a brief section set aside for NEGROES. Here is recorded the death of a son born to one “William Apes (an Indian),” a victim of the dysentery epidemic that swept through the town in 1803. This would have been a younger half-brother to Apess, born most likely after Apess’ parents parted ways sometime around 1802. 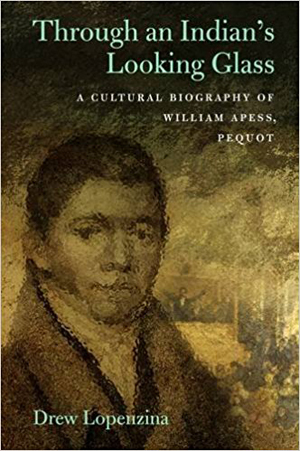 It was clear to me that William Apess was Colrain’s most famous and historically significant native son. And yet there was no indication that he had ever lived there, no trace of his birth, and certainly no mention of how he began his ministry here, two decades later, as an ambitious young proselytizer for the Methodist church. As is often the case when dealing with indigenous presence in the U.S., Apess’ memory has been scoured from the landscape, replaced with cigar store Indian type representations that still stand watch today over Route 2 (referred to by the state highway system as “The Mohawk Trail), a stone’s throw from the place of Apess’ birth. Colrain, itself, has been eager to correct this erasure and when I went there to speak about Apess a few years back, I was roundly welcomed for my efforts. Last July I approached the town selectmen about putting up a marker and they voted unanimously in favor. Placing an Historic Marker to honor Apess’ life and contributions is a small but significant step towards locating Native presence on the landscape, in a manner respectful of the complexity and purpose of those lives that history, up until this point, has relegated to its shadows. So thank you all for your generous contributions and please continue to spread the word. Check the Image Gallery tab on this page for a photo-documentary of some of my findings here, and keep asking of yourself and others, What Would Apess Do?